Choice Solar Solutions, based in Nashville, Tennessee is the parent company for the solar and geothermal business operating as Choice Solar & Geothermal, Inc.. Choice is a well reputed project developer, and EPC company, within the Tennessee, Alabama, and South Carolina states. Focused on complete energy solutions for commercial businesses, governments, real estate developers, schools, and utility companies their customers can save on electricity costs, reduce their carbon footprint, and add business revenue, while producing reliable, sustainable energy for the community. Choice Solar Solutions designs and installs turnkey solar electric and solar thermal systems and is a full service installer of solar and geothermal systems, Choice helps the consumer maintain operational control and maximize quality and savings. As an integrator, Choice Solar Solutions works with its customer from design to installation to grid-connection. 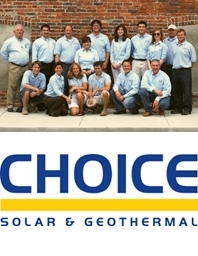 Meet the Knoxville Choice Team, your first choice in Solar. Why make Choice your choice in Solar? The answer is simple – the people. The Knoxville Choice staff was carefully selected to provide a depth of education and job experience that is unmatched. As we grow we continue to insist on these high standards. Our unique approach to solar PV is developing a business plan for your project, and as partners we tailor the plan to your specific needs. This business plan includes budgeting, financing, grants, tax considerations, design, engineering, permitting, installation, production and public relations. Our service to you is turn-key. Our team is designed to provide expertise through every step of the entire process, from site visit to final commissioning, all while providing excellent customer care. The Choice team has collectively brought millions of dollars in Federal and USDA grant money for several megawatts of solar to the TVA Valley. These successes are attributed to the people of the Choice Solar Team. Harvey Abouelata has 25 years of experience developing strategic business plans. Lisa Leonard has spent years in the construction industry providing successful marketing plans, workforce development, and training programs. Mary Shaffer Speight and Lauren Steier have knowledge and experience in grant writing and preparation, as well as government policies for solar energy. Patrick West has an extensive accounting and construction background with passion and expertise in solar design, engineering, and financing. Our solar installation team is led by NABCEP-certified Jason MacIsaac who has installed multiple megawatts of varying systems. This team includes Brandt Womack and Scott Noethen who have extensive classroom and on-the-job training installing a variety of systems, including multiple dual axis tracking systems. Collectively, the Choice Solar Team is responsible for a variety of solar successes, from off-grid cabins in the mountains to multiple utility-scale systems. The vast amount of technical experience and education of this team allows us to accurately think though EVERY SINGLE aspect of your design and install, insuring your system is commissioned on time, on budget, and exceeds performance expectations. We are committed to installing quality systems that offer cost-effective solutions for our customers, provide positive testimonial for Choice, and serve as examples of excellence in the solar industry. Our goal is to continuously exceed your expectations. In addition to our teams’ extensive experience, Choice is backed by Barron Partners, a global leader in clean-tech investment. Barron Partners provides Choice with tremendous buying power and a network of resources unmatched in the Southeast. This allows Choice to install and design quality turnkey solar PV systems at optimal prices for our customers. There is only one Choice Solar Team. Make the right Choice for your solar PV project.